There are several ways of making the quality of your house and your lifestyle a lot better. One of the factors that improve it is the cooling system used in your home. Using the right air conditioning system will help increase air ventilation inside the house and a livable thermal condition. 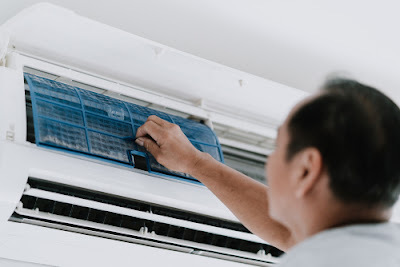 Provided with the current condition of the environment where global warming and heat waves happen to come and go, air conditioners are necessary for every home, hdb flat, business establishment, and other offices in Singapore. Choosing an air conditioning unit for your home is not that easy. You can't just be random about it and pick the cheapest unit. If you do, you're sure to have lots of regrets later on. Remember that just because a unit is cheap, it doesn't mean that it's of good quality. On the contrary, you have to be wary about these really cheap units. Chances are, they'll wear out faster than you expect. When that happens, you'll have to purchase a new one again. That would mean double the expenses on your part. In order to avoid such a situation, there are essential qualifiers to be followed when choosing the right air conditioning unit that will suit the cooling needs of a particular area in your house or hdb flat. They are as listed below. When you pick the ideal unit, it is essential to consider the size of the actual unit. It is definitely wrong to say that the bigger the unit, the cooler and more comfortable the area becomes. Apart from the unit's size, the actual dimension of the room and other aspects of the area where you want to install the unit must be considered. Installing a big aircon unit in a small place will be very inefficient and appropriate. Additionally, you also need to look at the specifications of the product as this will have to agree with the design of your house. You need to take a look at the parts of the house that will affect the amount of outdoor air that will get inside the house. The number of windows, the ceiling, and wall insulation will definitely affect the circulation of air and temperature. You'll need to determine your home's cooling requirements for you to ascertain that the unit you buy is the appropriate size. For this purpose, you will need to consult with an experienced professional contractor. Window dimensions, exposure, insulation, local climate, and more will have to be considered. Basically, the best types are those that are able to provide dependable performance while operating with minimal electricity. You can be sure that it's a good enough unit if it still performs well year after year with proper maintenance. Also, make sure that it is quiet and doesn't require so much servicing. Nowadays, there are units that have energy saving features which will come out more efficient even if they cost more compared to the regular air conditioners. As such, you might need the services of a professional to guide you through the selection and installation of the aircon system. There are plenty of air conditioning systems homeowners can choose from these days. However, a ductless split air conditioner is more ideal for a 4 room HDB flat in Singapore. Ductless split air conditioners are ideal for homeowners who need to cool multiple rooms. The installation of such types will generally involve the placement of the compressor, condenser and expansion valve within a single unit outside and another unit inside along with the cooling fan and coil. These are usually highly efficient for cooling more than one room or for large spaces within your home. You have to take note though that these systems will cost slightly more for installation. 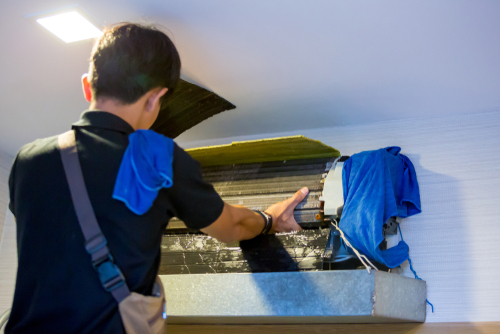 However, it will not require ductwork and only will only need cleaning once a year. Air-conditioning and heating compose most of an average home power bills. Many times this has been the reason why home energy bills skyrocket during the hot months like January. Since air-conditioning has been the culprit, doing something about it can improve your bills. • One thing you can about air-conditioning is to lower the thermostat. You don't need to chill yourself. All you need is bring the temperature to a desirable level. It would be very beneficial for your body as too much cold could offer no benefit. Besides, you can save a lot of wasted energy in this. Your unit can also take some rest with a lower setting. • Checking for gaps and drafts is basic for air-conditioned rooms. 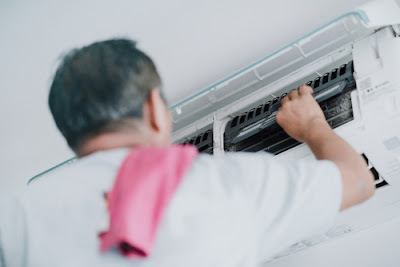 These small drafts will slow down the cooling cycle thus will make your air conditioner work more rigorously in order to hit your specified temperature. Sealing off this air entrance is the remedy for this. As airflow will be stabilized and so is the temperature. • As a basic, refrain from opening your door wide and prolonged. This can reduce efficiency incredibly. Most folks are not looking into this as they perceive it as normal. But if you are going to ignore this, you're really missing some good points in saving your electricity. • Another effective way to reduce wasted power is to divide your house into several, smaller capacity, air-con units. By this, you should look into installing separate units in the living room and your bedroom. Dividing the capacity will cut your consumption by up to 50% as it can effectively cool a smaller room using minimal capacity. • Use fan mode if you have that setting. Modern air-con units have this capacity which can switch to using only its fan when you set it to do after a few hours of use. This alone can save hours of usage as morning temperature, mostly, are colder which can best dealt with fan mode rather than the cooling power itself. Installing aircon units and maintaining them is not an easy job but with the above information, you can do it in a way that will help you save money not just from electricity bills but also from maintenance of your unit.